Our vision is to create a gateway to the Sauganash business district by attracting commercial development and consumer spending by transforming and enhancing the area around existing retail space, attracting new restaurants, and maximizing occupancy of office space and storefronts within the underutilized business corridor on Cicero Avenue between Devon and Peterson. We envision Sauganash evolving as the premier business corridor of choice for all shopping and service needs. We will create a pleasant, hassle-free experience for consumers to walk, bike, shop and dine at local businesses. We will harness the retail spending power both within Sauganash and beyond by marketing the area to restaurateurs, small businesses and others as the ideal spot for parking plus one-stop shopping, errands, appointments, dining and more. The SSA will work to promote the benefits of Sauganash to prospective commercial enterprises, as well as to end consumers. The SSA service provider is the Sauganash Chamber of Commerce. The SSA Commission will work with the Chamber of Commerce to create district enhancements including landscaping, decorative lighting and community identifiers, as well as marketing the district through the internet, promotional print materials, and newspaper advertisements. 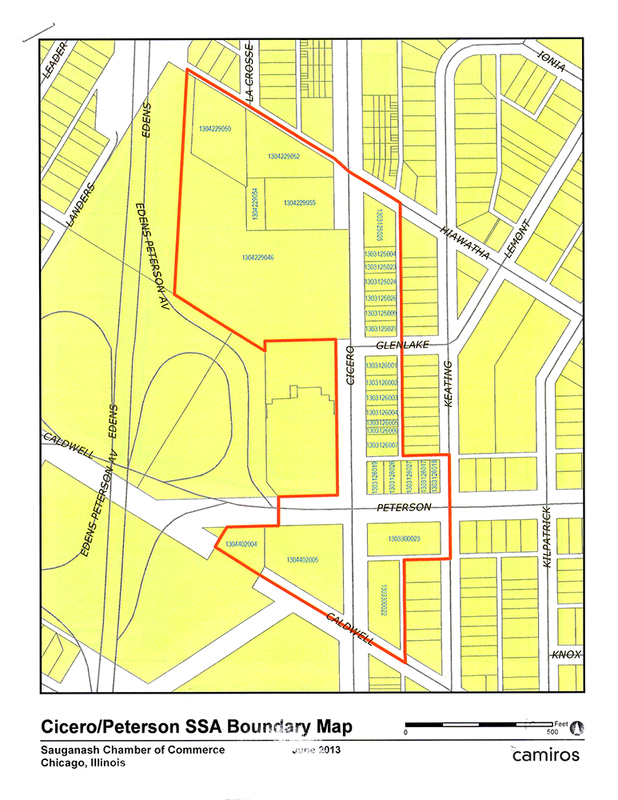 The Sauganash SSA is approximately 20.5 acres in size and generally bounded by the Edens Expressway and Cicero Avenue on the west, Hiawatha Avenue on the north, the alley east of Cicero Avenue and Keating Avenue on the east, and Caldwell Avenue on the south. It is located in the Forest Glen Community Area in the 39th Ward. The 2011 equalized assessed value (EAV) of the 33 tax parcels within the SSA boundaries is $20,327,572. Commercial property accounts for 94.0% of land and 97.2% of total EAV. There are no underlying TIF districts within the Sauganash SSA. Based on the 2011 EAV, an estimated tax rate of 0.369% would be required to support the proposed first year budget of $75,000, which is expected to be a typical annual budget for the 10-year life of the SSA. The tax rate cap has been set at 0.500%. Commitment to the Sauganash community as demonstrated by service on Chamber Board of Directors, good faith initiatives toward the business community over time through participation in business initiatives including Wet/Dry referendum, district parking solutions, and investment in the business district. Familiarity with the community based upon business occupancy/property ownership in Sauganash SSA area. The SSA commissioners will be guided by bylaws created to oversee and approve annual budgets, and the SSA Work plan to make sure there are adequate resources to run SSA operations. SSA commissioners will also support the SSA Manager and provide general oversight on behalf of property owners and business owners in the Sauganash business district. The SSA commissioners will also be responsible for verifying the availability of annual SSA funding and reviewing the business practices of SSA staff. The SSA Commission is a public body subject to the Illinois Open Meetings Act and all commissioners are appointed by the mayor.